Yes indeed, SIMAnswers 2.0 is finally here! 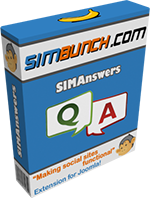 This is the much anticipated major upgrade to the already famous SIMAnswers, the perfect Q&A solution for Joomla!. This upgrade is packed with so many new features that it is sure to blow your mind! In fact, it is now so robust, an entire website can be created around it. "SIMAnswers is the kind of extension that when you see it, you have to get it immediately, then think of what you want to use it for later. It has created so many new website ideas for me the past year, and I'm getting new ideas for it all the time!" "SIMAnswers is like instant Yahoo Answers or Answers.com for my Joomla website"
Details of the upgrade after the break ! Contacts import (for emailing questions to friends) now detects ParaInvite . If ParaInvite is installed, SIMAnswers will use its contacts import scripts instead. Category selection now immediate. No more additional AJAX requests required. I think I'm not gonna wait longer. Awesome upgrade, definitely worth getting.